We are building a great program of unique opportunities for meeting other attendees. We’ll start things off with a Kick-Off Networking Event, to connect you with other first-time attendees as well as long-time NASFAA conference participants. Throughout the conference there will be designated locations during meals and receptions for you and other first-time attendees. When you first arrive at the NASFAA Conference, you'll see a lot of people talking in the halls. You may even see some hugging the first day. And you'll begin to think "everyone knows each other and I don't know anyone." We all started out that way at our first NASFAA Conference. In no time at all you'll have new friends and colleagues, new ideas and knowledge, and plenty of contacts to maintain after you return home. The exhibit hall is a fun and exciting place, so you will want to drop in to see all the latest products and services. You'll need to wear your name badge to enter the hall, as well as to attend the meals and sessions. Near the front entrance to the exhibit hall is the NASFAA booth. Stop by to meet the NASFAA staff and get any questions answered. We can show you the many products and services that are part of your NASFAA membership, including the AskRegs Knowledgebase, Compliance Engine, and Student Aid Index. While it is impossible to attend every session, a little planning beforehand can help you maximize your time. The online schedule will be available in the spring, and a week before the conference, we'll post an electronic copy of the full program. Our event app will also available then so you can download session handouts and presentation materials submitted by presenters. Please note that not all presenters provide handouts to post. Read through the session lists and pick at least ONE session in each time slot, then pick a back-up. In some cases, popular sessions are repeated at different times or days. If other staff members are going to the conference with you, we recommend daily strategy meetings — decide who will attend each session, visit the exhibit hall, etc. It's also helpful to recap the day's events each afternoon. We recognize that having someone help you navigate the conference can help enrich your experience. 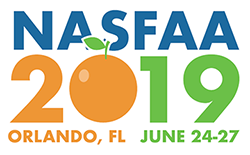 Fellow NASFAA members volunteer to serve as conference mentors who will be available to help you meet other attendees, network, and select sessions. You can sign up for a mentor when you register for the conference, or watch for announcements in Today’s News. Mentor assignments will happen in late spring.